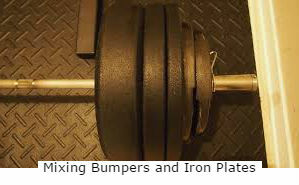 Do you need to blow $400 on a set of bumpers, or are iron plates ok? The first thing you want to do is not piss off Coach Rip! Here’s his take on the bumper plates vs. iron plates problem. Mark Rippetoe is strength coach, author of the popular books Starting Strength and Practical Programming for Strength Training and is widely looked up to as a top guru in strength training. He’s also entertaining and right to the point, as you can see (seriously, watch, it’s good info).You might also want to visit startingstrength.com, where they have an active forum. As long as you aren’t training near your max, and you’re careful, you should be able to get by with plain old iron plates. It’s best if you start at light weight, do a lot of practice over time to improve your form, get consistent, and slowly go up in weight so that you can consistently lower the weight back down from shoulder rack position as shown in the video. Note that Rip is doing this on a lifting platform. At a minimum you want some 1/2″ or 3/4″ rubber flooring underneath you. If you’re serious about it, a platform is great to have to help absorb the impact even better, and even if you get a set of bumper plates down the line you will make good use of the platform to extend the life of your bumpers. And it will absorb enough impact to reduce the risk of your neighbor/family going postal on you from shaking the earth with your drops. 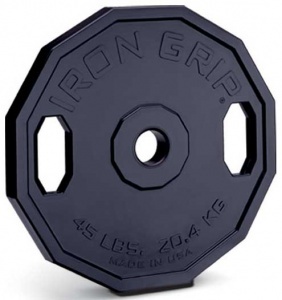 Iron Grip, Hammer Strength and other companies make multi-sided grip plates, usually 12 sides. These are horrible for deadlifting. They can rotate a tad as you lift, then when you set it down it hits a plate on a corner and wants to roll one direction or the other, maybe right into your shin. For multiple reps without stopping, you can’t do touch-and-gos on the floor for this reason. I inquired with York Barbell about deadlifting with their Iso-Grip plates, which have very large hand holes. Specifically I was just asking about the diameter of the 45 lb plates, because ideally they will be 450mm / 17.72″ diameter, the standard regulation size in case you end up having to mix them with other plates or you want to get the right starting deadlifting height. York told me that none of their grip plates are meant for deadlifting, because of the holes. I’m having a hard time understanding that. Their Iso-Grip plates are made of a steel-iron composite, very strong stuff. 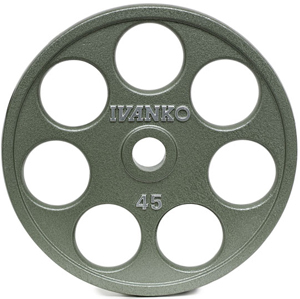 It was a while back, and I’ll have to check again with my current York rep.
Ivanko revolvers have been used for deadlifts for decades. Look at those huge holes! There’s more hole than plate. If these don’t break, nothing else should. I guess it’s the same principle by which a wheel with spokes holds up. As long as it’s engineered right, the limited amount of structure supports force on the edges. Still, if you’re doing cleans and dropping the barbell, it’s best to avoid grip plates. Dropping any iron plates from a couple feet high from a failed clean can be dicey, and dropping grip plates at that height is a gamble. If you’re pushing the bar overhead and going heavy with it, whether it’s jerks, snatches, or just overhead presses without the safety bars of a rack to catch it if you fail, you’re probably going to want bumper plates. It’s mainly a question of, Can you consistently lower the weight back down? Bringing the bar down from overhead, in control, is tough on your wrists when you’re going heavy. Moving it back down into a full-grip overhead press position puts a lot of load on your wrists, while bringing the bar back down directly into the “rack” position (ie: front squat or clean position, on your shoulders) takes some practice and is still tough to do with heavy weight. When it comes to doing only deadlifts, you have a lot more flexibility in terms of the plates you choose. It’s not such a big deal. Powerlifters use iron or steel plates (powerlifting discs) and typically not bumpers. If they can set new records without breaking plates, then you’ll be fine doing a fraction of that in your garage. A pile of iron dropping against a forgiving rubber floor is stronger than you are. When mixing iron and bumper plates, be sure your bumpers and 45lb iron plates are all 450mm (17.72″) diameter so that neither will be left hanging above the floor and make for an absolute pain to load the bigger ones on the bar. Once that’s taken care of, you should find nothing weird about doing deadlifts with any mix of iron and rubber. They’re all just plates. Of course, you’ll get a little more rebound from bumpers if you do multi-rep touch-and-go deadlifts. Below is Alan Thrall deadlifting some big number with iron plates, specifically the Troy premium plates. Is it ok if I use a couple bumpers and throw a bunch of iron plates on the bar too? Here’s the problem. Bumpers don’t last forever. They’re engineered to take their own weight when dropped. When you start adding iron that doesn’t touch the floor, the bumpers have to take even more weight. It might not seem like much, but it does have an effect. It will reduce the life of your bumpers. “Change” plates are one thing. That’s what we call iron plates 5lb and smaller. So it’s ok to slide on a 5lb and 2.5lb. Probably even a 10lb. I know, you’re asking, How about a 25lb iron plate? Or two 10lb? Or just maybe like a 10lb and a 5lb? Right, because I’m here to negotiate with you about it. I don’t know – Is it ok if I have another candy bar? How about half a candy bar? 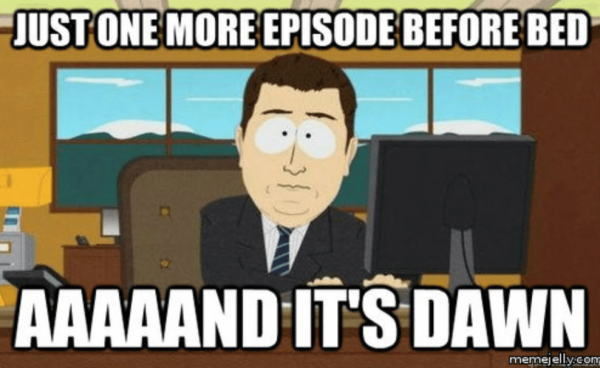 How about vegging out in front of the TV for just a little longer, and work out later? The more you push the envelope, the more wear you will cause to your bumpers. If you’re willing to take the gamble, by all means go for it. Up until now we have assumed we’re lifting in a civilized manner, with nice rubber flooring or even a platform. Can I drop bumpers on bare concrete? It hardly needs mentioning that dropping iron on concrete is a bad, bad idea. The funny thing about bare concrete is: The more expensive the bumper, the worse it wears on bare concrete. The expensive competition bumpers have lots of steel inside them that jacks up the price, and they’re really accurate, but the thing is, they don’t bounce. You need bounce to soften the impact. This even goes somewhat for a dead-blow bounce economy bumper. The bounciest are the Hi-Temps. While I don’t think they’re warrantied for use on bare concrete, they are one of the best ones to do so with if you’re lifting in your garage and rubber flooring isn’t possible for you right now. You can get them from Rogue. They’re the same as the ones Hi Temp Weights sells and are just re-branded for Rogue. I currently have cast iron rubber coated weights, do you think these will be suitable to drop from overhead onto an olympic platform? Rather than having to invest in a full set of bumper plates AND an olympic platform? I expect the bar or plates will get damaged. You could get a pair of 45lb and 25lb bumpers and that will get you started. That’s definitely not the same as bumpers which are designed to be dropped. Just like the previous comment. Expect bar damage (warping) and plate damage over time if you do.